Last Monday, Ashok sir took a very good session on ‘Effective Time Management’. One of the key things he explained was about ‘Important Urgent Matrix’, also called ‘The Time Management Matrix’. Currently I have started categorized my weekly tasks with this matrix. As per the matrix, Tasks you have decided or assigned can be categorized as urgent or not urgent & important or not important. So we have 4 quadrants. 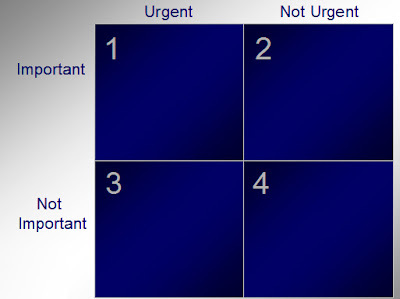 Now its up to you to choose the perfect quadrant for each task you decided to do. Few examples for each quadrant. Quadrant 4: Some time-pass mails, Chatting, Watching meaningless TV Shows, In short all the things which wastes your valuable time.